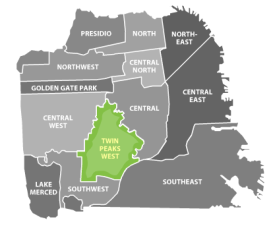 Often referred to as Twin Peaks West, San Francisco District 4 is located in what was once a heavily wooded, scenic expanse of land. Prior to 1918, the area was fairly inaccessible from downtown San Francisco, but the opening of the Twin Peaks Tunnel created an easy commute into the city center, making the area attractive to real estate developers. District 4 has a total of 16 neighborhoods; Balboa Terrace, Diamond Heights, Forest Hill, Forest Hill Extension, Forest Knolls, Ingleside Terrace, Midtown Terrace, Miraloma Park, Monterey Heights, Mount Davidson Manor, Sherwood Forest, St. Francis Wood, Sunnyside, West Portal, Westwood Highlands, and Westwood Park. Twin Peaks West, which includes Mt. Davidson and Glen Canyon Park, is predominately a residential area with gracious, upscale neighborhoods. Careful planning by architects and developers created "residence parks" featuring wide, elegantly landscaped boulevards that follow hillside contours, rather than a typical grid-style city street layout. Much of the districts commerce can be found in West Portal, a vibrant community that offers a small town atmosphere with upscale businesses, lots of great restaurants, and virtually no chain stores. Dominated by Mt. Davidson, the highest natural point in San Francisco, Twin Peaks West offers an assortment of communities and varied architecture. St. Francis Wood, Forest Hill, and Balboa Terrace are upscale, exclusive communities. Diamond Heights arguably has the largest concentration of Eichlers and mid-century modern homes in the city, and family-friendly Ingleside Terrace and Sunnyside are close to the I-280, making them a commuter's dream. Many homes, particularly those built in Sherwood Forest, Miraloma Park and other hillside neighborhoods have panoramic views extending out to the ocean on the west, and the bay and even Mt. Diablo to the east. Real estate in the Twin Peaks West area is highly desirable, and when homes come on the market they often receive multiple offers, making competition for these properties fierce. Many different architectural styles are represented from Spanish Mediterranean to mid-century modern to Craftsman bungalows designed by such notables as Timothy Pflueger, Bernard Maybeck, John Galen Howard, Henry Gutterson, and Joseph Eichler. District 4 Homes + Condos for Sale - Updated Daily! For more information regarding single-family homes, lofts, and townhomes for sale in District 4, contact San Francisco Modern Real Estate.